my my my, my key lime pie! Just in time for summer, these cupcakes are simply amazing! 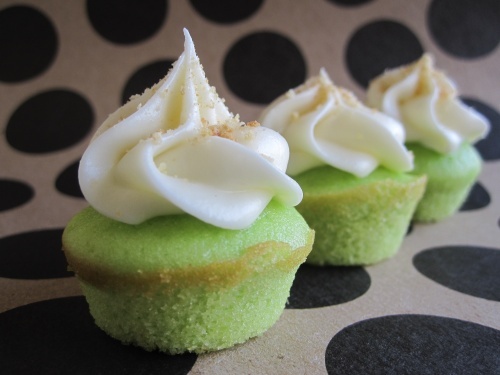 Each one is like a delectable bite of key lime pie, a little piece of paradise. It’s the perfect balance of tangy and sweet, and the cream cheese frosting is a great compliment to the lime. These may well be my new favorite cupcake flavor, I found myself popping one after another throughout the work day (minis have a way of tricking your mind that way). I chose to make my (40!) minis straight in the pan–no sleeves–and they came out with this great golden edge that gave it a very key lime pie kind of look. Seriously, these things are addictive and even now I am staring across the room at the few that made it through the day and back home, I am wondering if I might make it into the double digits by night’s end. Just kidding. Sort of. Preheat oven to 350°F. Line standard muffin pan with 12 paper liners–or grease the pan and go commando! Whisk both flours in medium bowl. Set aside. Beat butter & sugar in large bowl until creamy. Beat in eggs 1 at a time, then the lime juice, grated zest, and food coloring (batter may look curdled—but don’t fret!). Beat in flour mixture in 3 additions alternately with buttermilk in 2 additions. Fill each cup just over half full. Bake cupcakes until tester inserted into center comes out clean and tops spring back when touched— 9 to 10 minutes for mini cupcakes OR 20 to 25 minutes for regular sized cupcakes. Cool 10 minutes. Remove from pan; cool.